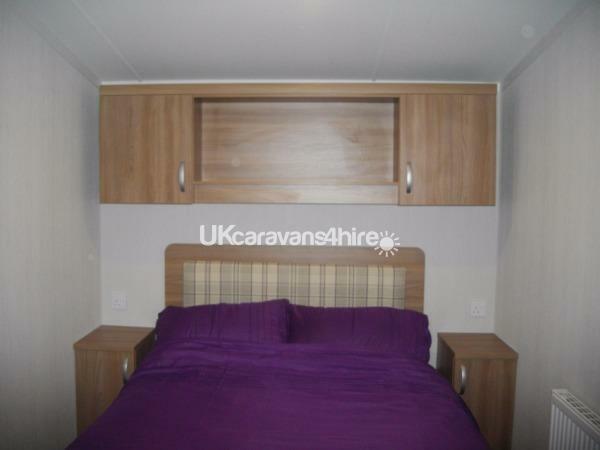 SWIFT BORDEAUX EXCLUSIVE static caravan for hire. 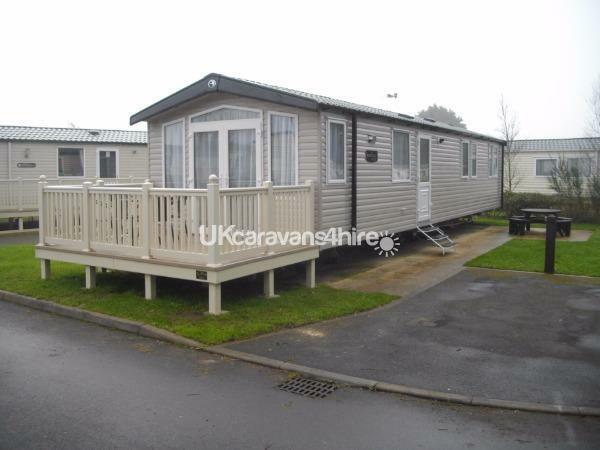 Our brand new 2017 caravan is prestige with decking graded by Haven and is being sited for March 1st. It is fully double glazed and central heated. It has 3 bedrooms, 1 double and 2 twin,all beds have memory foam mattresses. There is also a 26" TV in master bedroom. Each room has a wardrobe,and storage cupboards.There is also a pullout double bed in lounge.Quilts and pillows are provided, but you will need to bring your own sheets, duvet covers and pillowcases. We have a childs high chair and travel cot but cannot supply mattress and sheets/quilt due to health and safety regulations. There is plenty of room for this cot in the master bedroom.. It has a large shower room with toilet and washbasin, and a separate en-suite to master bedroom toilet with washbasin, which is also handy if someone is using the shower!. We are sited on a new large corner plot in Osprey, which is close to the shops and reception area. The new pitch has a landscaped garden with private parking alongside the caravan and an outside patio area with an 8 seat picnic table. 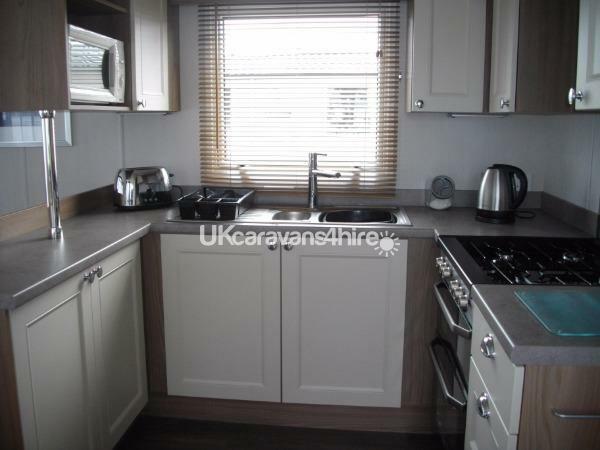 This Caravan has a fully equipped kitchen with larger than normal fridge/freezer,microwave,full oven,toaster,kettle and iron.Plus crockery and utensils for up to 8 people. The dining table is free-standing and will seat six comfortably. 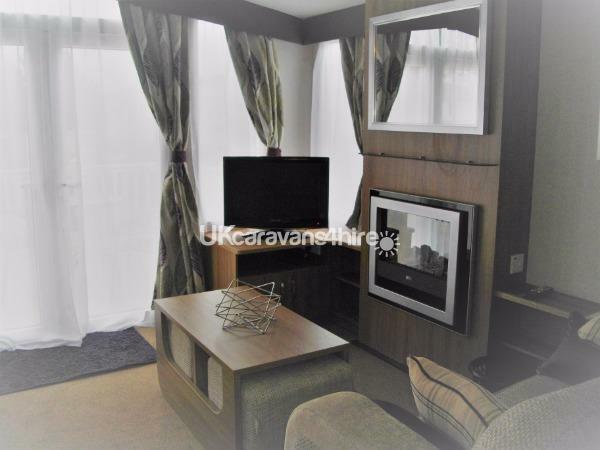 The large lounge has two settees, and an electric fire, if needed.We have a 32" flat screen TV with free-view and DVD player. The patio doors open onto the enclosed 8ft x 12 ft decking area, which can be left open on warm days.There is also a 4 chair and table set on the decking, which is handy for the kids to use. There is an additional 2 folding chairs under kids bed if needed. The site is owned by Haven Holidays, which run loads of activities for you to do on your holiday, including kids clubs, sports and leisure activities, indoor and outdoor pools.The indoor pool has been refurbished, and they have made it bigger and added outdoor fountains.The outdoor pool is only open at peak season. In the entertainment complex you will find an amusement arcade,and soft play area for the little ones.You will also find Papa Johns Pizza, they will also deliver directly to the caravan. New for 2014, is Cooks - fish and chip shop, and Millies Cookies. If you want to eat out, on the site,the Harbour Lights has a wide menu for you to choose from. Upstairs you will find the Live Lounge, for all your evening entertainment, and daytime activities. There is a lift available. You will need to purchase entertainment passes to use these facilities, as they are NOT included in the hire price. Local attractions are Caldy Island, Heatherton, Folly Farm, Annas Welsh Zoo,and Oakwood. The walled town of Tenby is a 10min stroll away,and the award winning South Beach is a short walk away. Our breaks are only 7 nts Fri - Fri , 4 nts Mon - Fri , 3nts Fri - Mon. We do not start any breaks on Sat. Check in time is 2.00pm and check out at 10.30am. We require a deposit of £50.00 for 3 or 4 night and £100 for 7 night breaks with the full balance due 8 weeks before your holiday start date. An additional bond of £50.00 is due at least 2 weeks before your start date. This £50.00 is refunded after inspection of our caravan after your departure. We are now taking bookings for 2019. Thank you. Sorry Ironman weekend is unavailable. Thank you. Additional Info: Indoor Pool Refurbished With Splash Zone, Archery, kids clubs. Had a fab stay in this caravan. 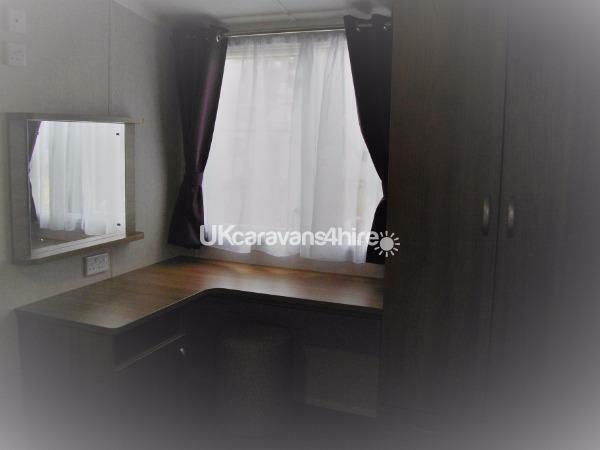 It was spotless & had everything you could want also well situated in park with easy access to shop etc. Just got back from a lovely stay in this beautiful caravan. Great location in park. Clean and comfortable. Luxurious and modern. Has a lovely little garden with seating area to the side which is a sun trap. Professional service from owners, reliable and friendly. Looking forward to our next holiday there, my children cried when it was time to leave! Thank- you! 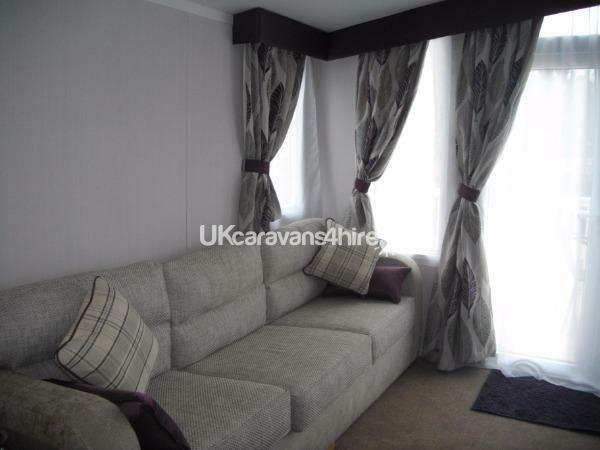 Caravan is superb a real home from home, clean, tidy, comfortable, spacious. large fridge/freezer, decking area and picnic table. 1 minute walk from shop and 3 minute walk from entertainment/swimming pools/play park. while we were there the site had an owners weekend, owners came down made sure we had everything and stayed in trailer tent for weekend while we had their caravan....thanks Liz. nothing was a bother, great service.